* APY = Annual Percentage Yield. Daily balance (the amount of principal in account each day). Fees could reduce earnings on the account. Rates subject to change without notice. Penalty may be imposed for early withdrawal. Rates subject to change at any time. 1APY = Annual Percentage Yield. Minimum balance = the amount of principal in account each day. Fees could reduce earnings on the account. Rates subject to change without notice. 2 1.50% 90 Day Intro Rate = The promotional rate to applicable tiers is guaranteed for 90 days from the day of account opening. After 90 days the rate may change at any time as the Heartland Bank Money Market Savings account is a variable rate account. 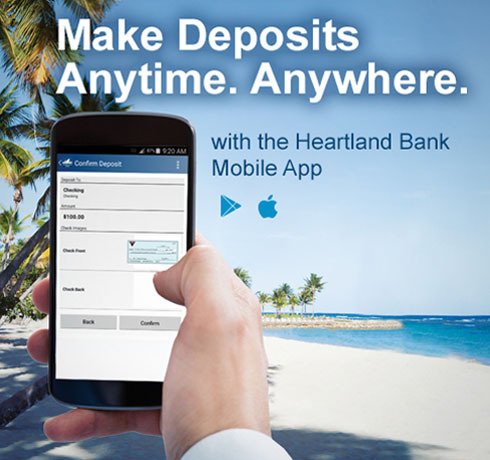 To qualify for the promotional rate, the opening deposit must be from funds not currently on deposit with Heartland Bank. Fees may reduce earnings. Accounts closed less than 180 days from date opened will be charged an early close fee of $25.00. One account per household.